Arby's bolsters their Market Fresh sandwich line-up with the addition of the new Turkey Avocado Club and return of the Pecan Chicken Salad and Ultimate BLT this summer. 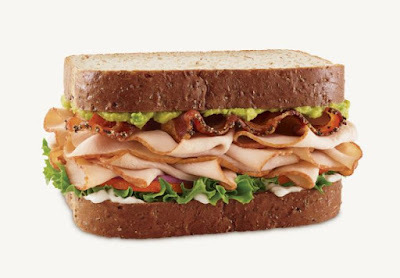 The Turkey Avocado Club consists of zesty avocado spread, pepper bacon, roast turkey, red onions, tomato, leaf lettuce, and mayo on honey wheat bread. The Pecan Chicken Salad sandwich features pecan chicken salad made with roast chicken breast, diced apples, pecans, celery, and mayo served with leaf lettuce on honey wheat bread. The Ultimate BLT includes eight slices of pepper bacon, tomato, leaf lettuce, and mayo on honey wheat bread. For those looking for something even heartier, the chain is offering the Triple Decker, which features oven-roasted turkey breast, pit-smoked ham, roast beef, pepper bacon, Swiss cheese, cheddar cheese, mayo, spicy brown mustard, red onion, tomato, and leaf lettuce on honey wheat bread. Arby's Market Fresh sandwich line, offering deli-style sandwiches, was first introduced back in May 2001.